This is my absolute favorite pattern I have ever found is there any way I could pay for the pattern so that I could sell the hats that I make from it or put a link to your pattern? I'm so glad you like the pattern as much as me! I believe I replied via google+, if not you are free to sell anything you make from any of my patterns. 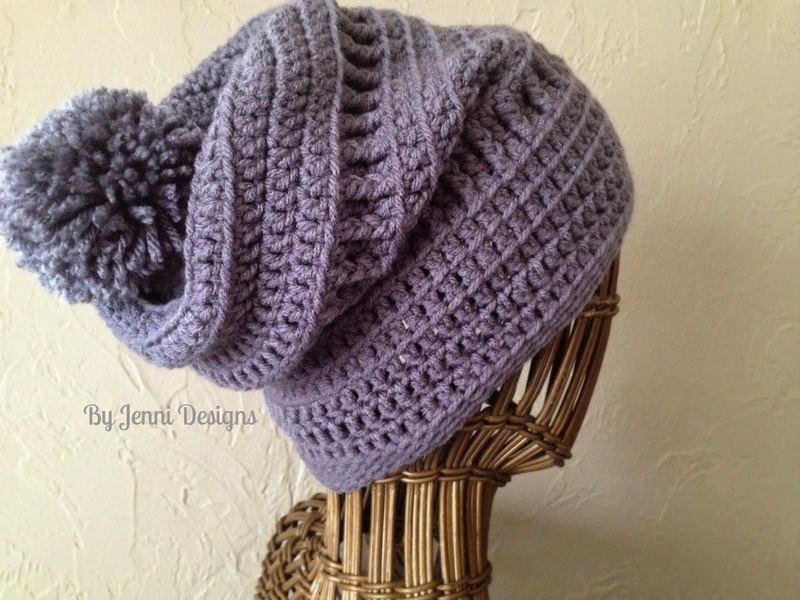 I want to thank you so much for those gorgeous patterns for the hat & the cowl neck scarf. They are so beautiful and I will start making some for my 5 grand-daughters as Christmas presents.....and get them done early, as I'm sure I'll spot other nice patterns before Christmas rolls around. Once again, thank you. You're very welcome, I am happy to hear you can use the pattern. I had a lot of fun creating it and it's always well received as a gift. Thank you so much for this pattern! I love the finished product. It was really easy to follow - thanks again! Didn't mean it to be anonymous… Not sure why it shows that way. Maybe you can work some decreases in the last couple of rows or would it still be too bulky at the top of the hat? I adore this hat! I just finished making it, it turned out beautifully and the pattern was so easy to follow. 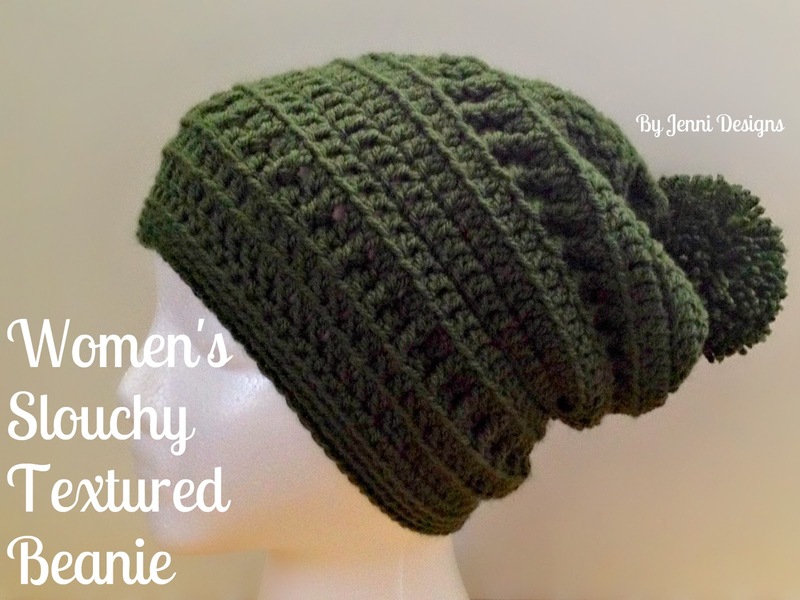 I do believe this is my favorite slouchy hat pattern so far and it's free! Thank you! Thanks for your kind words Yvonne, I am glad you enjoy the pattern, you are very welcome! Hi! I'm working on this beautiful hat now. For rows 5-6 the fpdc I'm not sure how to work them. One way looks like there are gaps and the other way the stitches look too close together. Any suggestions? Hi Sharon, I've never tried this hat with ear flaps but I like the idea! I worked up some ear flaps on my own textured slouchy beanie, here's the quick pattern for you. If you want to keep with the theme and have some texture on the earflaps you can work the rows in the BLO (back loop only). Join with a sl st, ch 1. You'll need to leave 24 stitches unworked in the front of the hat and 17 in the back of the hat. Do not fasten off, work a row of sc's around the hat and earflaps. Fasten off and sew in the ends. I love all your designs, they're beautiful. I just had one question on rows 5-6 aswell, so, I go around the post, then miss the unworked stitch at the top, which brings me to my next fpdc, do I skip the front post stitch that's next to the dc and go onto the next post or is it only the top dc stitch I leave unworked? I'm sorry if that doesn't make sense, it's difficult trying to explain what I mean. Have a great day! For round 3, do you do all the stitches in the back loop? Hi Su, here is a chart from Ravelry that states worsted weight is equivalent to 10 ply in the UK. http://www.ravelry.com/help/yarn/weights I hope this helps! I really loved the way this looks. I'm so picky about my hats. I will be making this for myself as a Christmas present!!! A woman in a crochet group I am a member of shared her hat she made from this pattern, and she shared the link for all of us who are so interested in this beautiful hat. It's absolutely lovely, thank you! Thank you so much and you're welcome! :) I am crocheting up some this year for Christmas gifts too! The hat in the photo is made from this exact pattern, you just can't see all the rows that are up by the pom-pom. Hi Jenni! Could you explain to me how you counted each row? I seem to get more stitches than what is stated. Do you not count the ch 2 at the beginning of each row? I get a total of 12 in magic ring including the ch2 and then 24 in the 2nd row and so forth... I'm sorry I don't get it! Hi Maria, if you read under the Important Notes section you'll see that the ch 2 does not count as a dc in this pattern therefor it shouldn't be counted in the stitch count. I have made 3 slouchy beanies in 2 days, wonderful pattern. I used Caron simply soft yarn; they came out beautiful. Hi Meredith! Thanks so much for sharing, I looove that yarn too! i made this hat once before and it came out way too small for me (but my friend loved it). How would I go about making it fit a 24"-25" head? You can try going up a hook size and then when you get to row 9 you should have a better idea if it's going to fit correctly. I just finished mine, I love it! I love this hat so much! Perfect fit thank you! I keep trying to make your nice beanie but the stitches always cup on the 5th and 6th rounds of fpdc. Is this right? Hi Shirley, thank you. I don't mind at all if you share the photo for your link. I appreciate the share! Hi Jenni, is the dusty purple and olive hat made using the same pattern? The olive hat (at least to me) seems shorter. Beautiful pattern. Hello Leanna, I am not sure which dusty purple hat you are referring to? What does front post double crochet mean?double crochet in the front loop? Hi Jenni!!! I am going to give your pattern a try. I have had great difficulty in finding a pattern that isn't too large and too difficult for me to learn. This is my first attempt at making a stocking cap with a pom pom. Is this pattern actually made in rounds instead of the stated rows? Hi Jenni!!! This is my first attempt at making me a stocking cap I have been crocheting since 1975. I have never been able to get the gauge right for a hat or crochet garment until now! Thank-You so very much for this pattern. I live on Social Security Disability and unfortunately money is a big issue for me. I have to rely on free patterns by necessity. This stocking hat fits perfectly and will keep me warm during the cold Missouri winters. Blessings to you for making these patterns available to people like me. Now to make the matching scarf and cowl. I was searching for a cute slouch pattern, and I found it in your Slouchy Textured Beanie! I like it a lot. Thank you so much for sharing your amazing pattern! I have a question about Rows 5 & 6. If I start my fpdc in the 2nd stitch, I end up with only 20 fpdc. And then what happens to the first stitch? If I only ch 2 in that stitch, would I lose it as a stitch because the ch 2's don't count as stitches? Hats like this have seemed too difficult for me as I have only been crocheting for a couple of years. I decided to tackle this one because I liked the looks of it so much. I am almost finished with it and it is looking beautiful. Thank you so much for a beautiful and easy-to-read pattern.